Slickly professional follow-up to 2005's The Back Room fails to deliver the same jittery thrills. Bottom line: Editors will never be as big in America as they are in England. It's not just that their influences are too easy for internet critics to delineate. It's not just that it doesn't rain as much here as over there. It's not just that bands like the Killers have dampened our collective enthusiasm for that old new wave. It's simply that the band's not quite expert enough at its particular pastiche to get really excited about. Don't get me wrong, Editors are slickly professional about what they do -- clinical, even -- and they've already shown us they can construct a solid indie-disco song, and churn it out multiple times. There are a couple of examples of this on the new record -- we'll get to them -- but on the whole, the soaring choruses on exhibit here feel obligatory rather than really earned. 2007's the year of sanitized follow-ups, it seems: from A Weekend in the City -- do you even remember that? -- to An End Has a Start, to Interpol's underwhelming new album. In line with those two other major indie releases, the new Editors album is more slickly-produced, it's more sedate overall, and it has its sights firmly set on a more mainstream audience. The result, while likely disappointing to fans of the edgier songs on The Back Room like "Bullets" or "Blood", is at least artistically consistent. On the spectrum of disappointment, Editors don't sound like they're making a desperate grab at radio airplay (a la Bloc Party) or like a cheap imitation of their early, ascetic selves (a la Interpol). Instead, An End Has a Start seems like a sanded-down version of the original; the trouble being, of course, that those rough edges were among the first album's most enduring pleasures. I've been hearing the Smiths in everything recently (not sure why), and it's not that there's even an explicit musical link between these two bands, but Tom Smith surely shares something of Morrisey's melancholy. The problem is, Smith's expression of it is disappointingly surface-level. On the best songs, true, Smith does nail his own brand of soaring depression, but lyrics jumble together in butting clichés, and get stuck somewhere in the throat. "In the end all you can hope for is the love you felt to equal the pain you've gone through" -- indeed. Lyrically, things aren't all down and out; the singer promises that "Every little piece of your life will mean something to someone" and, more personally: "Now don't drown in your tears, babe, I will always be there". But it's a cold comfort; that we never really believe in a happy ending for Editors is part of the band's dark-hearted appeal. A number of the songs on An End Has a Start seem to be stitched together from disparate ideas that relate to each other only peripherally, if at all. As if the band arrived at the studio with a bunch of fragments, and ended up with bookshelves of ideas stacked one after the other, labeled as songs. So on more than a few tracks ("The Racing Rats" and "Escape the Nest" are examples), the band relies on Ed Lay's pounding drumbeat and Chris Urbanowicz's jittery guitar fuzz to carry songs to completion. Occasionally, though, enduring the bulk of a track rewards with a fragment that hits really hard: the chugging crescendo coda of "When Anger Shows", for example, with its complex piano figure and inexorable wall of guitar sound. The best song by far is the opening track and first single, "Smokers Outside the Hospital Doors". It's a conventionally glorious sound, but the construction is strapped tight: truncated chorus on first iteration, expanded gloriously next time around; neatly rising melodic line; textural interest derived from the apposition of piano and chiming guitars. This one song, at least, proves the band deserving of continuing attention. And even though its forays into sparse melancholia mostly plod, the band does reach a true feeling of peace on "Well Worn Hand". When Smith sings "I can't face the night like I used to before" the effect is all haunting regret, simply stated and quite powerful. 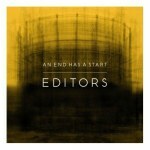 An End Has a Start doesn't have the glorious indie-disco hits of Editors' debut, and its toned-down sheen leaves us wishing for more bite ... two strikes. But the band avoids the fatal blow with a still-deft understanding of how to use influence -- not as a substitute for content, but as a guide to style and attitude. The craft of the album's on full show, and dedicated Editors fans will find plenty of melodies to sing along to. But for those not already sold on the band's brooding indie rock, there's little apart from "Smokers" to get excited about.